Sooo, you’ll notice you don’t contain a lot of nonfiction in your pile. Having parents who held us to the New Testament injunction “whatever is true, set your mind on these things,” I wasn’t allowed to read fiction as a kid. Unfortunately, unlike my other sibs, I… hated… it. I’ve had no truck with nonfiction ever since, but, since I’m, like, old now, I’m trying to let old grudges go. Crucial to that task, I’ve been recently gifted with not one, but two works of nonfiction. One trick in Nonfiction for the Disinterested is to read books which are references. I love reference books because I am That Nerd, and give me a dictionary or thesaurus or encyclopedia, and I am happy. Another trick is finding a nonfiction book which has a media tie-in. A book about Chinese dragons tied to a story about Mu-lan? Awesome. A book of poisonous plants as seen on Midsommer Murders? I’m there. 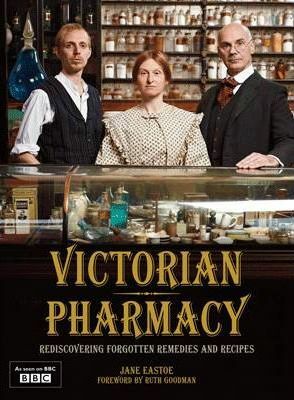 VICTORIAN PHARMACY, by Jane Eastoe is a little of both – it was a show on a show on BBC2 in 2010, and it’s a reference book currently useful to me in my fantasy WIP. Considering Queen Victorian reigned a whopping sixty-four years, there was time for a lot of change in the medical sciences during the Victorian Era. Children under 10 were prevented from working in mines and as chimney sweeps. There were the first flushing toilets, and a truly heinous cholera epidemic from where said flushes took human waste (hello, Thames, looking at you). Balanced against the famine death of 800k in Ireland, the massive surge of immigration and the opening of workhouses, electric lights, electric railways and free schooling for British children ages 5-13 begin to slowly swing the old England toward something new. In the Victorian age, science prospers as information becomes more widely available, and superstitious remedies and the old fears begin to be replaced with facts. One thing I do enjoy about nonfiction is the lack of narrative allows me to put the book down and muse on what I’m reading. As I’ve read along, I found myself eager to try some of the pharmaceutical recipes – or, I will, as soon as I can decipher the ingredients (A pomade powder for bug repellent which the author says actually works calls for powdered orris – apparently it’s iris root, …which I’m sure someone sells… somewhere?). This book is both informative and instructive, has enough pictures to make the learning feel like entertainment, and will make a great coffee table book if I don’t have it on hand in the office library. This one’s a win, dear TBR. outer space. Korean shape-shifters. spirits.